Great selection of drink and beverage clipart images. Browse these featured selection of beverage and drink cliparts for use in websites, blogs, social media and your other products. Drinks and becerages are the most commonly see goods in stores and supermarkets I think. Beverage cliparts can be used in parties, store logos and flyers as well as supermatket brochure. Such delicately-designed cliparts can play a role wherever drinks are needed. Edraw infographic provide users with various bread cliparts, including cocktail, champagne, juice, milk tea, slush, lemonade, cola, coffee, tea, beer,wine, coconut juice, soda, liqueur and margaritas etc. Click on the picture as follow to download these high-quality vector cliparts. Edraw clipart maker allows you to creat your personlized beverage symbols and import them in a new library. Beginners can get inspirations on color-matching and layout from the buil-in beverage symbols without drawing skills required. You can simply change the color, size and content of these cliparts tofor your own use. If you are a good painter, the drawing tools and geometry operation under Symbols tab will help a lot in designing drink cliparts you prefer. Here are some examples of drink and beverage cliparts for use in websites, blogs, social media and your other products. 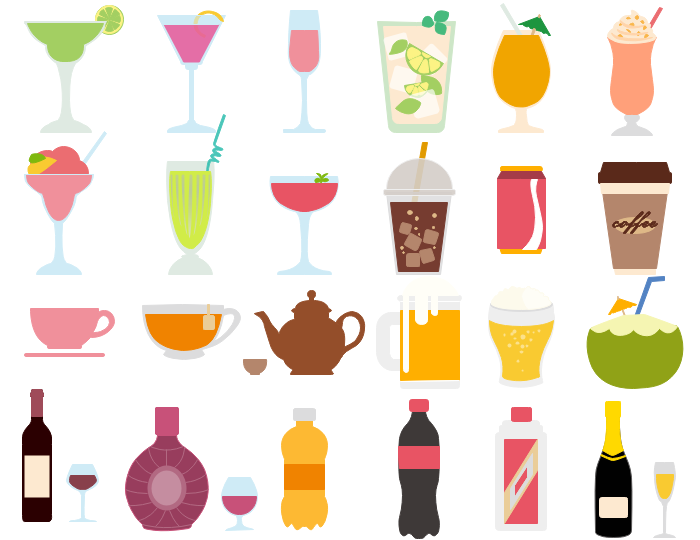 In this section you will find vector images related to the topic of Drink and Beverage Clipart to download in a click. 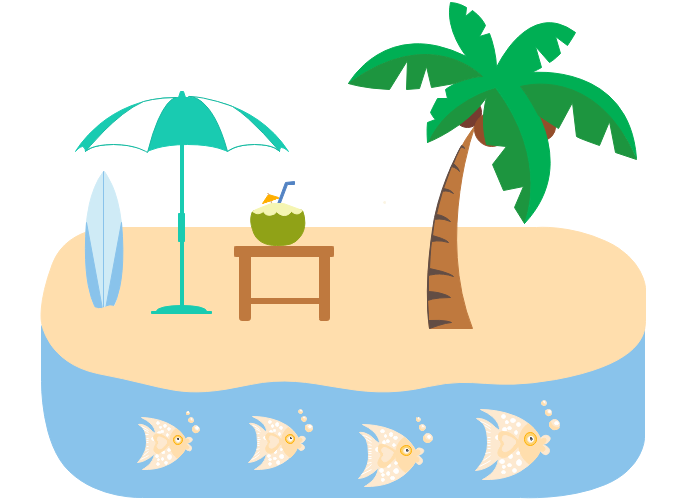 The following is a picture of beach lanscape with beach, fish, umbrella, coconut tree, juice and sailing equipment. It can be used as an advertisement leaflet of beachside tourist attractions. The example below simply consists of sweets, pudding and drinks. This can be used as either a word card for children or a poster of a beverage store. More vector elements such as bread cliparts could be added if necessary.